BOSTON, Aug. 05 /CSRwire/ - Sappi North America, leading producer and supplier of diversified paper and packaging products, today announced that it will move forward with a $25 million capital project to update its Somerset Mill woodyard. This strategic plan will allow the company to modernize the wood debarking, chipping and chip distribution systems. This capital investment will improve reliability, reduce white wood losses and costs as well as enhance efficiency gains through the increased production of wood chips. The commissioning of the new system will be complete by the end of November 2017, following a temporary woodyard shutdown for installation. Specifically, upgrades will be made to the log infeed, debarker, chipper, chip transfer system, woodroom controls and bark handling. 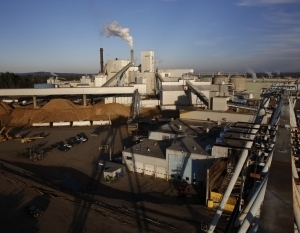 For more information on Sappi North America’s Somerset Mill, please visit the website. Sappi North America, headquartered in Boston, is a market leader in converting wood fiber into superior products that customers demand worldwide. The success of our four diversified businesses – high quality Coated Printing Papers, Specialised Cellulose, Release Papers and Specialty Packaging – is driven by strong customer relationships, best-in-class people and advantaged assets, products and services. Our high quality Coated Printing Papers, including McCoy, Opus, Somerset and Flo, are the key platform for premium magazines, catalogs, books and high-end print advertising. We are a leading manufacturer of Specialised Cellulose used in a wide range of products, including textile fibers and household goods, and one of the world's leading suppliers of Release Papers with our Ultracast and Classics lines for the automotive, fashion and engineered films industries. Sappi North America is a subsidiary of Sappi Limited (JSE), a global company headquartered in Johannesburg, South Africa, with more than 13,000 employees and manufacturing operations on three continents in seven countries and customers in over 100 countries around the world. Learn more about Sappi at: www.sappi.com/na. Learn more about how Sappi is investing in sustainability and innovation in the 2015 Sappi North America Sustainability Report: http://bit.ly/21KNUHW.